This great stackable desktop organizer is as beautiful as it is functional. 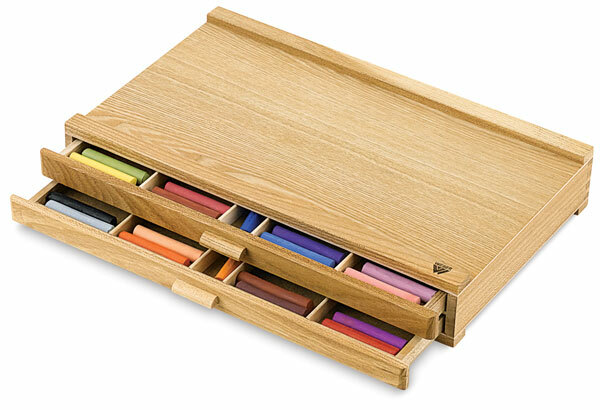 It takes care of little items like pens, pencils, pastels, and brushes within its fixed drawer dividers, and looks elegant in any workspace. These cabinets are constructed from solid, seasoned hardwood with a hand-rubbed oil finish. The cabinet has two drawers, each with four fixed slots measuring 3"L × 8-3/8"W × 5/8"D and one additional slot measuring 8-3/8"L × 1-1/2"W × 5/8"D. Cabinets are stackable. The exterior dimensions are 9-1/2"L (9-13/16" including handle) × 15-5/8"W × 1-7/8"H (2-5/8" including reinforcing strips of wood along top edges). Each cabinet comes fully assembled. Note — Wood color may vary.